In 2010, I found myself touring schools in the South American Country of Colombia. On more than one occasion I encountered other storytellers asking me if I knew anything about Kamishibai. This was surprising. At one school, a teacher approached me and asked me if I had ever met a storyteller named Mukashi Mukashi. I figured this was coincidence and nothing more until, in 2011 I was touring Mexico. As a welcomed retreat I, along with several others, was invited to the home of two prominent storytellers in the capital, Victor and Angel. I was excited because Victor is not only a renowned storyteller but a world class chef as well. I would not only have an opportunity to have many of my questions about Mexican folklore answered, but I’d be doing so while sampling some delicious cuisine. When we arrived at Victor and Angel’s home… you won’t believe this; Victor began raving about, of all things, Kamishibai. Victor talked about a man he called Pepe who introduced him to the art form. Victor went on and on about his friend Pepe and then brought out some Kamishibai wooden boxes that he had designed to convey Mexican legends and folklore. They were beautiful… impressive! I couldn’t help but to start envisioning how this same art form could help me convey the splendor and beauty of Africa. I was being bitten by the Kamishibai bug and I hadn’t met Pepe or Mukashi Mukashi. Once again, I return to the United States and all thoughts of anything Kamishibai fled from my mind. I was free of the Kamishibai bubble. When I arrived in Peru four weeks ago, the first performance I did was at the National Library for a group of elementary school children. Our coordinator’s name was Tatiana and she was excited about storytelling. After completing four performances for her school, Tatiana and I began to talk. She told me that her husband was a storyteller. “Wonderful,” I thought. I love meeting storytellers from other cultures. I told her that I would love to meet her husband and asked his name. She answered, “His name is Pepe Kojachi but he goes by the stage name of Mukashi Mukashi. First, I had to get over the fact that Pepe and Mukashi were one in the same man and then I had to grapple with the fact that, after all these years I was sitting in an auditorium having a conversation with the man’s wife. Kamishibai would not leave me alone. 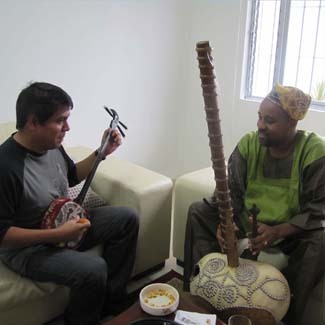 From Poland to Colombia to Mexico and now Peru, I was coming into contact with Kamishibai. I explained to Tatiana that I had to meet her husband and that his name kept popping up everywhere during my travels. We exchanged emails and she explained that he was out of Peru but would return soon. In another week I got an email from Pepe. I was excited. He invited me to his home. I would finally meet the man whose name continually crossed my path. Yesterday, I went to Pepe’s home that he shares with his wife and two children. We talked, ate, laughed and exchanged a few true life tales. The man is a creative genius and I do not use those words lightly. His talents extend to many mediums of art and he is not a prisoner of his own imagination. I got to see first hand, some of Pepe’s newer inventions. He personally walked me through the history of Kamishibai and talked about his desire to spread its use far and wide. Mukashi Mukashi is a man to be respected not only for his passion, but for his devotion to family and craft. As I was leaving his home I experienced a tinge of sadness. These were beautiful people and I wanted to stay in their presence a little while longer. I don’t know if I’ll experiment with Kamishibai or not, but one thing I can tell you is that it is definitely in the forefront of my mind now.